The tree that will stay up until Jan. 7. The Rockefeller Center Christmas tree is in place and will soon be strung with 50,000 LED lights as one of New York City's most prominent seasonal attractions. The 72-foot-tall Norway spruce arrived on a flatbed trailer Saturday morning and was hoisted by a crane into a spot overlooking the Rockefeller skating rink. Crowds will gather Nov. 28 for a televised ceremony to see the tree burst alive with 5 miles (8 kilometers) of multicolored lights and a 900-pound Swarovski crystal star. The 75-year-old spruce comes from Wallkill, 60 miles (96 kilometers) north of New York. It was donated by Lissette Gutierrez and her wife, Shirley Figueroa, from their home property. They nicknamed it "Shelby." Millions of people are expected to visit the tree that will stay up until Jan. 7. 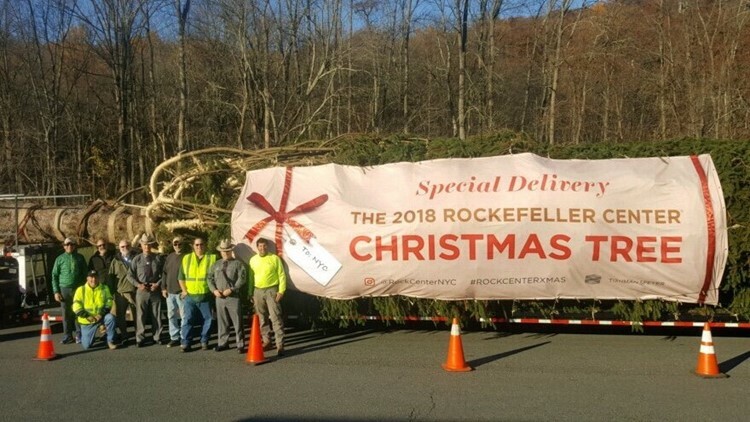 The 2018 Rockefeller Center Christmas Tree makes its way from Orange County to New York City.